Children from the Palestinian Youth Parliament commemorated the fourth anniversary of the loss of the American International Solidarity Movement activist Rachel Corrie by opening a permanent exhibition for her that includes pictures and personal belongings at the parliament site in the center of Rafah governorate. The exhibition. which was attended by a large number of children and others, also contains Rachels’ writings and a symbolic coffin covered with the Palestinian flag. The exhibition was opened by reading commemorative poems written by two girls in English: Nadeem AlMahaydeh (11 y o) and Islam abuSharkh (12 y o). 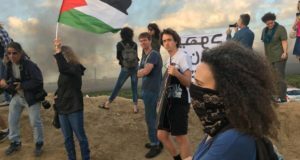 The two girls spoke about Rachel’s heroic stand in front of an Israeli bulldozer in an attempt to stop the demolition of a Palestinian home, a stand that cost her life. The two girls emphasized in their poems that the children of Rafah in particular and all children of Palestine will never forget Rachel and she will be in their memories as long as they live. The children then hung placards with slogans that commemorate Corrie and wish that she was with them : “Rachel we will not forget you”, Rachel we need you”, Rachel Corrie died as a Palestinian, we welcome her in the highest esteem and honor”. Children then put wreaths and olive branches on her symbolic coffin. They sent their wishes and honor to Rachels’ parents who live in the US and who joined the children for the third anniversary commemoration last year. After posting a large picture of Rachel on the wall of the exhibition, Ameer Barakeh (14 y o) took a few steps to Rachel’s symbolic coffin, placed some flowers, looked for a long time at her picture and his eyes got misty and tears rolled down his cheeks. Baraka said “even though a long time has passed, she is still in my mind and every day I remember her wide smile when she used to come to this parliament, sit with us, talk to us, and give us gifts of toys and clothes”. 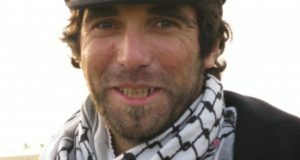 He added that he and other young parliamentarians plan to hold commemorations regularly for Rachel Corrie, Tom Hurndall, James Miller and all members of the solidarity movement who lost their lives. AbdelRaouf Barbakh, the supervisor of the youth parliament emphasized that the idea for the exhibition came from the children themselves who brought the possessions and gifts Corrie gave them and began collecting statements. Barbakh invited all civil and other groups to come to visit the exhibition. 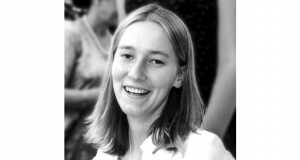 Rachel Corrie (23 y o) lost her life under an Israeli army bulldozer on March 16, 2003 while attempting to stop the bulldozer from demolishing a home belonging to a Palestinian citizen near the Brazil neighborhood southeast of Rafah city.